About Our Company | Cascade Gasket & Manufacturing Co. Serving the Aerospace & Aviation Community for over 70 years! Mr. F.M. Terry founded Cascade Gasket & Manufacturing Co. Inc. in 1946, and Cascade has manufactured rubber parts for every model of Boeing aircraft built since then! We manufacture molded rubber seals and die cut gaskets for over 250 companies in the aerospace market. 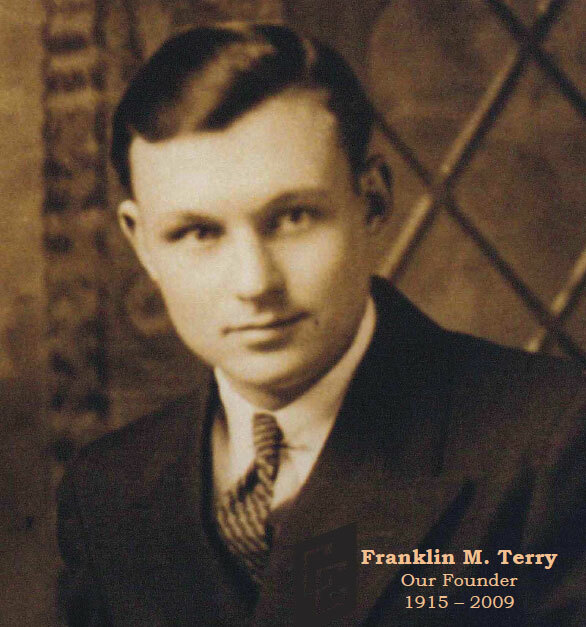 Our founder, Franklin Marshall Terry, was born in Watkins Glenn, New York in 1915 to parents Claude and Martha Terry. He never liked the names “Franklin” or “Frank”, so was known as Mart to his family and friends. His father was the town barber and provided his family with a modest income. Mart’s mother was an active member of her church and local chapter of The Eastern Star. The family moved to Painted Post NY in the early 1920’s and rumor has it that Claude ran a numbers racket out of the barbershop. This claim, however, will not be confirmed nor denied. Mart and his younger brother Bob helped contribute to the family income by picking beans and strawberries during the summer. A budding entrepreneur, Mart would fill buckets with water and wait at the bottom of a local steep hill for Model T’s to come down with their brakes smoking. Drivers would pay him 5 cents to put out the fire! Mart worked hard as a teenager and had an early respect for a job done well. One of the experiences he liked to talk about was when he worked as a mail carrier for the town of Painted Post. Each day he retrieved the mail being thrown off the DL&W train as it roared through town. This train traveled about 60 MPH, and that bag could be a mile either way next to the tracks. Rain, snow or sunshine, he was there to find the mail and deliver it. After graduating from Painted Post High School, Mart attended the University of Michigan with an engineering major. To put himself through school he had a number of jobs around campus. While at the U of M he met his future wife, Mildred Castle. They married in November 1938. Mart worked for a while at the Ford Motor Company but his favorite job was at Detroit Gasket, where he worked as a rubber chemist. Compounding black rubber (e.g. neoprene, SBR, and nitriles) seemed to be a natural vocation for him. During WWII he continued at Detroit Gasket supporting the war effort. When WWII ended, Mart, Mil (she didn’t like Mildred) and their children, son Marshall and daughter Carol, traveled west. He knew that Boeing was looking for suppliers, and with his experience making gaskets from rubber and rubber-like materials, he knew he could support his family. They moved to Seattle where he would start his new business. They chose the name Northwest Rubber Company, but that name had already been taken. Instead, Franklin M. Terry’s dream, Cascade Gasket & Mfg. Co. Inc., was incorporated in January 1946. Cascade Gasket started out on East Marginal Way in Seattle, in a building that had been used as a chicken coop. It was the only property they could afford. They started with just three employees: Mart, Lewis Castle (his father-in-law) and Frank Dean, all formerly with Detroit Gasket. Mart bought some sheet stock, converted an old printing press into a gasket press, and they were in business. Finding customers was not as easy as he thought. There were many months of putting more money into the business than bringing dollars home for his family, which had grown to five with the birth of daughter, Lee. During the first years of business he established credit with the local banks and was able to borrow when needed. He made a habit of paying off all loans quickly. As the gasket business grew with the help of the Port of Seattle, PAC CAR, and The Boeing Company, Cascade Gasket was able to move to a larger location, afford more people and, of course, more gasket presses. The 1950’s brought another addition to the Terry family, daughter Allison. The 50’s also brought a chance for Cascade Gasket to expand their product line to include compression rubber molding. Mr. Terry’s plan had always been to keep as much business in-house as possible, so he designed and then built the rubber presses they would need. All tooling was made in-house to meet the unique requirements of the compression rubber molding business. One little known fact was that Cascade Gasket was the first manufacturer of shim stock in the northwest. The process involved painting adhesive on to very thin aluminum sheets (about eighteen inches square), layering these sheets, and then pressing the heck out of them. Buckets were placed beneath the press to catch the run-off adhesive. Needless to say it was a pretty messy process, but it was just like Mr. Terry to try new ideas. One of his favorite things to tell employees was, “Don’t tell me it won’t work unless you’ve tried it”. In the years that followed, Franklin Terry and his wife Mildred created a business that was based upon quality, on-time deliveries, and communication with their customers and suppliers. The company’s reputation grew and the business expanded. In 1965 Cascade Gasket moved to its current location in Kent, Washington. The new facility was a 2000 sq. ft. cinderblock building with a flat roof. There were 20 employees by now and business was good. The 1960’s were a turning point in the product line of Cascade Gasket. Mr. Terry realized the company needed to expand and diversify. He started to shift from primarily a gasket cutting shop and the molding of carbon-based materials, to compression molded silicone gaskets and seals. The niche he had found in the aerospace industry was working well for the company. Qualifying and testing materials was a requirement of the aerospace industry and in 1974 Franklin Terry hired Robert Walker to run the Quality Control department. Bob’s father, Bill, worked for Boeing Material Technology and he was pleased that Bob chose to follow in his footsteps. Bob Walker was instrumental in developing Cascade Gasket’s new silicone compounds to the standards required by Boeing and revamping our EPDM rubber compound. Today after 45 years, he is still known as the “Mad Scientist of Cascade Gasket”. The business was still growing and by the 1980’s there were 35 employees. In 1983, Mart hired his daughter Lee Terry to run the front office. She had worked for The Boeing Company for 17 years. During that time Lee had received a well-rounded education in customer service, shipping, receiving, and finance from Boeing. It was at this time that Cascade Gasket started to delve into the fabric-coated seal world. Cascade Gasket’s product line would again shift to include this intricate handcrafted manufacturing process. The business was growing, and in 1987 a new office was built to house the customer support staff. When general manager Mac Groby left the company in early 1989, Lee took over that position. Mr. Terry was still active and remained President of the Corporation, but Lee took over the day-to-day operations. The 1990’s were years full of new QA requirements, computer installations, and increasing business, again, some hard decisions had to be made. In 1993 the QA department was upgraded, and a new 4015 sq. ft. facility was built behind the original cinderblock building. Mildred Terry passed away in December of 1999 and Mart took the death of his beloved wife very hard. He took the title of CEO and Lee stepped up to the position of President. The company had grown to 45 employees. With the new ISO requirements, the onset of Lean Manufacturing Principles, and the overall potential of new business, Lee realized that again things needed to change. A decision had to be made—to stay with about 50 employees and maintain the status quo, or for the company to become a driving force in the world of aerospace seals and rubber technology. It was decided that Cascade Gasket would continue to grow and to meet the increasing demands of its clients. Todays leadership is determined to set the path for future growth and continue the legacy started by our founder and the legacy that preceded us.